In the learning example referenced above, on he first slide, can anyone tell me how the author was able to animate the subhead and custom next button to appear as they do? 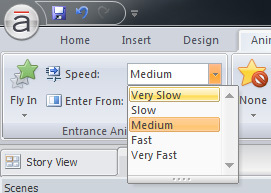 So slowly? I was trying to recreate to learn from it and i cannot seem to replicate the animation at that speed and the way it appears. Any thoughts? I know I am issuing something really simple. Thanks! When applying an animation to an object there is a drop down menu with different options for speed. This screen shot is from Storyline 1. The animation duration for all of the entrance animations on that first slide is set to 00.75. I think that might be what you need to adjust. I think you can now just use the duration to set the timing/length of your animation in SL2 instead of just being able to choose from "Slow, Med, Fast". This gives you more ability to fine tune the duration of the animation. Thank you so much Nicole. I think I needed more fine tuning in the duration field. I appreciate your response! Happy to help, Susan! Have a great day.